Maybe the greatest victory for the anti-fracking activists in New York State is switching the burden of proof from the victims to the producers. A hallmark of European environmental policy is to place the burden of proof on the industries producing suspect products—making industries prove their products will do no harm to the public or to the environment before these products are allowed on the markets. The reverse has been true on this side of the Atlantic. Decades of environmental and public health abuses by polluting industries—cigarettes, leaded gas and paint, using hydrofluorocarbons (super greenhouse gases) as a refrigerant, etc.—have been allowed to continue business as usual until enough time, health and environmental damage, money, and research finally brought the polluters to court. The burden of proof that Fracking in New York must not harm the public’s health is now the responsibility of the Fracking industry—which should have always been the case. In states like Pennsylvania, Fracking started without much research and since then it’s been the dickens for the public to prove that their health and water well problems have been due to nearby Fracking operations. When already ensconced, the Fracking industry looks on with disdain for those concerned about methane leaks and other concerns because once given approval by the state to begin their harmful practices, it is almost impossible bring them to task. This business-as-usual climate, where it’s harder to stop existing polluters than to switch to energy options that don’t pollute, must change quickly. Maybe New York State’s six-year Fracking experience can offer some practical insights to the necessary energy shift we must make if we are to keep global temperatures at 2C above preindustrial levels. Banning Fracking in New York State presents a major opportunity to address Climate Change by dramatically increasing the potential for renewable energy. 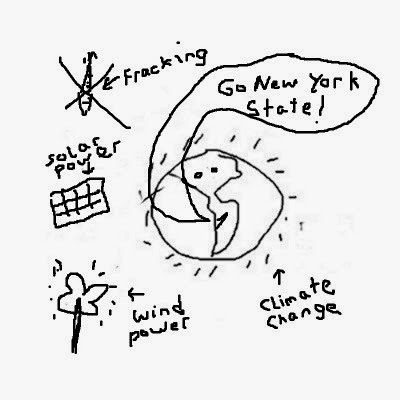 Now that we’ve dodged a major environmental challenge to our environment, our health, and our climate by NOT Fracking New York, we have opened the door wider for more wind and solar power. The economic obstacles presented by cheap natural gas is now reduced and gives the growing green energy industries the boost they need.